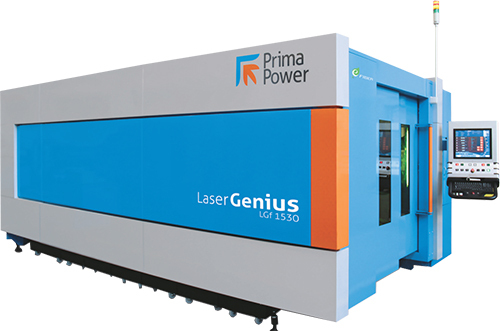 Prima Power’s new Laser Genius 2D fiber-laser cutting machines boast the innovative application of synthetic granite (for the frame) and carbon fiber (for the carriage). Linear motors on the X and Y axes reportedly yield a 15-percent increase in productivity compared with conventional drive systems. A high-brilliance 6-kW fiber laser delivers the beam to a cutting head that features a single-lens strategy, impact-protection system, high-dynamic focal axis with 35-mm stroke, and lens drawer with quick-alignment system. Among available options: Smart Cut, for fast cutting of thin sheets (to 5 mm thick) with reduced cycle times; Max Cut, for fast cutting of medium-thick sheets; and Night Cut, for intensive production using enhanced piercing- and cutting-process safety. The cabin comes in two versions: a lean design to minimize footprint, and an open design with fully opening sliding doors to optimize accessibility.